Every garage owner knows the luxury of their extra storage space— at least until it becomes full. They soon learn how quickly that luxury can become a burden. Garage clutter isn’t something that happens overnight. It builds slowly, right under your nose until before you know it, you begin to lose track of where things are or what you even own. If you’ve come to realize that your garage is more of a place to stash stuff then park your car, why not consider a makeover? This could mean anything from a good cleaning out, followed by reorganizing the area with just the essentials, or totally repurposing the room as extra living space. Before you do anything, you’ll need to empty the garage. It is essential that you get a clear view of what you’re dealing with. To do this, pick a clear day and haul everything onto the driveway or lawn. Separate into five piles: garbage, recycling, selling, donating, keeping (hopefully that’s the small one). This can be the toughest part of the project, since it’s often difficult to let go of some things. A popular rule of thumb is to get rid of anything that you haven’t used in the past year. Once you have your piles, haul away the recyclables, garbage, and donated items. The stuff you wish to keep can be stored in a shed, attic or basement, depending on what they are. Set aside the stuff you wish to sell for now. Bring the car back in. Give your garage a good cleaning and a fresh coat of paint, followed by storage solutions that utilize the walls and ceiling, allowing more space on the floor to park your vehicle. Transform it into a hangout space for the kids and their friends. Add some furniture, lighting, a small fridge for snacks, music and TV to provide a room like appeal. You can paint the garage door to match the walls, plus you’ll still be able to open it on the warmer days. Convert your garage into a home gym. You can even install hardwood flooring, sheet rock, recessed lighting and air conditioning to provide all of the comforts of going to the gym without even getting into the car. A garage can make a perfect home office, since it is out of the normal flow of the rest of the home. Most people who work at home often wish they had a space that was free of the normal household sounds, pets and activity of daily living. A garage converted into a home office may be the perfect distraction-free solution. A popular choice among families with small children (and their kid’s friends) is to convert their garage into a play room. Many of the above garage makeover ideas can still allow for storage within the garage. 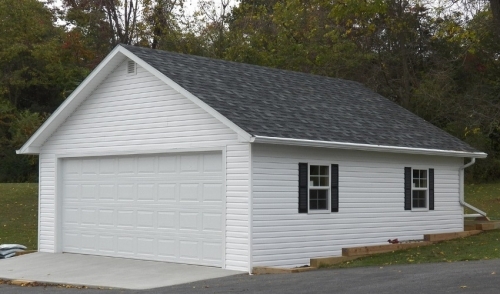 Garages come in all shapes and sizes, and therefore possibilities are endless. One half of the garage can be used for storage and the other for the office, play room, etc. It’s also important to note that keeping the garage door intact is still a good idea. For one thing, many municipalities require a permit to remove the garage door. Also, keeping the garage door has a positive impact on resale value. A garage is often a big selling point for homes, and retaining the option for future homeowners to use the space as a traditional garage is something to keep in mind.